The post-mortem examination conducted on Kumar's body confirms gunshot injury by .32 mm bore bullet on his head. 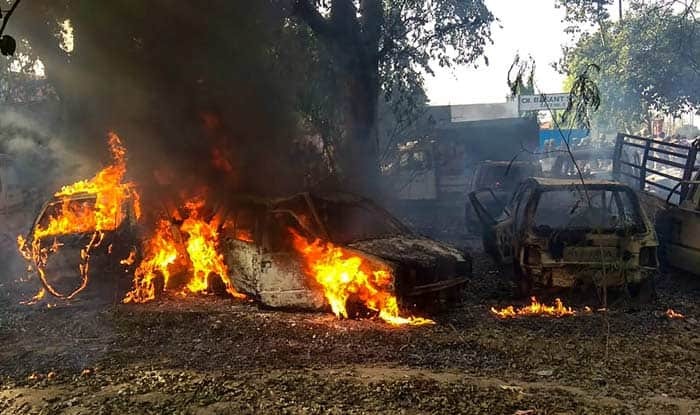 New Delhi: A day after Uttar Pradesh Police Inspector Subodh Kumar Singh was killed in Bulandshahr mob violence over the recovery of 25 animal carcasses, the widow of the slain officer said that he was being denied justice. “He worked with utter honesty and took all the responsibility on himself. This is not the first incident when he faced the situation bravely. He had bullet injury twice before. But now nobody is giving him justice. Justice will be done only when his killers are killed,” Singh’s widow said, while speaking to reporters. The post-mortem examination conducted on Kumar’s body confirms gunshot injury by .32 mm bore bullet on his head. A district court remanded three persons to judicial custody for 14 days in connection with the killing of Singh and 20-year-old Sumit. However, the main accused, Yogesh Raj, who is said to be a Bajrang Dal activist, is still on run. It has been reported that Raj led the mob which allegedly attacked the police team and killed Singh. Earlier in the day, police had lodged an FIR against over two dozen people for rioting and murder. As many as 27 people have been named in the FIR, registered early on Tuesday morning while cases have been lodged against 50 to 60 unidentified people. ADG (Law and Order) Anand Kumar said six police teams were working on the case and trying to identify the accused by monitoring video footage of the incident. “Tension has eased in the strife-torn Bulandshahr and efforts are on to ensure there is no trouble in future,” he told reporters. The National Human Rights Commission (NHRC) issued a notice to the Uttar Pradesh government seeking a detailed report on action taken over the killing of Singh and Sumit. Taking suo motu cognizance of media reports, the NHRC issued notices to the Chief Secretary and the Director General of Police of Uttar Pradesh, asking them to submit a detailed report within four weeks on the action taken against the miscreants, and relief and rehabilitation provided to the families of the deceased persons. Meanwhile, Opposition parties attacked Uttar Pradesh Chief Minister Yogi Adityanath, saying he was ‘enjoying’ a laser show and presenting kabaddi prizes in Gorakhpur when Bulandshahr was rocked by violence. Demanding Adityanath’s resignation, the Samajwadi Party (SP) and the Congress deplored him for attending the events rather than promptly reviewing the law and order in the state in the wake of the violence. Echoing similar views, SP spokesperson Sunil Singh Sajan said, “Adityanath was seen in the midst of ‘light, camera and action’ in Gorakhpur last night.” Sajan said that Addiyanath should resign as “he is unable to manage the state of affairs in the state”. The CPI(M) blamed Adityanath’s “communally provocative speeches” for the Bulandshahr violence and alleged that it has been “planned” in view of the 2019 Lok Sabha polls. “Such incidents are planned in view of the forthcoming Lok Sabha elections. The communally provocative speeches being made by Chief Minister Adityanath have also created an atmosphere for the mobs to act with impunity,” the CPI (M) said in a statement. Bahujan Samaj Party chief Mayawati too blamed the “irresponsible and wrong” policies of the BJP government in Uttar Pradesh. “Killing of (an) inspector and one other person in Bulandshahr violence is due to (the) irresponsible and wrong policies of the state government. Strict action should be taken against those involved in the act so that people can feel that there is a government here. Due to patronising of unscrupulous elements by the BJP, there is ‘jungle raj’ in the state,” Mayawati said. Adityanath, along with his Chhattisgarh counterpart Raman Singh, had last night attended a sound and light show on Nath sect in Gorakhpur, the video footage of which went viral on TV news channels. The 45-minute sound and light show prepared by the tourism department is based on the history and glory of the Nath sect to which the chief minister belongs. Rejecting the Opposition’s charges, UP BJP media co-convenor Navin Srivastava said that Adityanath had immediately directed Additional Director General of Police (Intelligence) S B Shiradkar to reach the spot and submit his complete probe report in two days. Human rights watchdog ‘The Amnesty India’ condemned the killings, saying a “culture of fear, hatred and impunity has spread across Uttar Pradesh”. “The Uttar Pradesh government has arrested four people so far in the death of police inspector Subodh Kumar Singh. But mere arrests are not enough. The disturbing truth is that cow-vigilante groups operate in many cases with the tacit approval of the state authorities,” it added. The sad reality in Uttar Pradesh was that nobody was safe from the violence perpetrated by cow vigilantes, neither the police nor the marginalised communities “or in fact anyone”, Asmita Basu, Programmes Director, Amnesty India, said. “The Chief Minister of Uttar Pradesh, Yogi Adityanath, must take responsibility for the death of the police inspector. A culture of fear, hatred and impunity has spread across Uttar Pradesh. Many more will be attacked by the cow-vigilante groups in the state if the government does not end the prevailing impunity and bring those responsible to justice,” she added.